Goods and Service Tax (GST), which is often known as a historic reform is now around the corner. After President gives his assent on 8th September 2016, the Government is firing all cylinders to implement GST by 1st April 2017. However, the implementation will be little early for the existing tax payers. Further enrollment here means the data of existing taxpayers and filing up the remaining key fields. The final date has not been declared yet except by Goa government. i.e. 29th November 2016. For rest of India, the date hasn’t been finalised. But, be cautious because dates maybe announced anytime soon. Any person with a taxable supply turnover over Rs.25 lakhs would be required to register for GST in India. There is also a mechanism available for voluntary GST registration to help claim input tax credit. The term person under GST law includes proprietorship, partnership firms, Hindu Undivided Family, Company, LLP, Society and any other legal entity. GST registration must be obtained within 30 days of exceeding the Rs.25 lakh turnover limit. In case of those having existing service tax or VAT registration, procedure would be announced for migrating the VAT or Service Tax registration as a GST registration. It is expected that GST registration would be provided based on PAN. Another major advantage of GST implementation is that the same GST registration number can be used in all states across India. Under the current VAT regimen governed by the State Governments, a VAT dealer must obtain VAT registration in each of the State, incurring additional cost and compliance formalities. 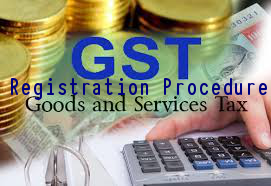 GST registration procedure would be online through a portal maintained by the Central Government or State Government. The applicant would have to submit an online application for GST registration using Form GST-1 along with detail of the good and services to be dealt. Online payment for the registration fee would be made available and temporary GST registration number would be provided on submission of application. On submission of the application, the applicant would have to print a copy of the application, attach the documents mentioned above and courier the same to the GST department. On verification of the application, final GST certificate would be issued by the concerned officer. GST registration procedure is expected to be a completely online process, similar to the service tax registration process. GST is now a reality, and it is far more complexed and stringent when it comes to compliance with it. Enrollment is only a procedural aspect; However, the real game will begin from 1st April 2017. I would recommend all the existing taxpayers or the new comers to get prepared for the GST because the law has very harsh penalties which could cost you few lakh even for a small mistake.